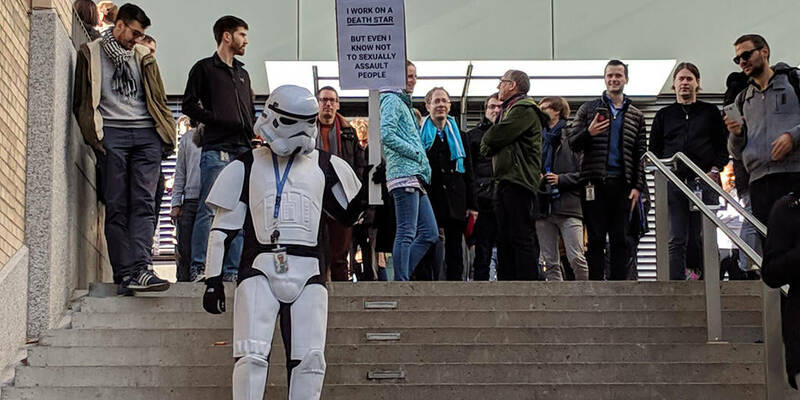 A Google Employee dressed as a Stormtrooper holds a sign outside Google’s Zurich offices. The “Google Walkout For Real Change” protest has begun, and it’s much bigger than we first thought. Google employees around the world are participating and it’s happening now. The Google walkout is meant to protest the way Google handled its senior executives accused of sexual misconduct. The protest was set to start at 11:10 AM local time for each Google office participating. Offices participating include, London, Singapore, Dublin, Tokyo and more. Part of the employees’ concerns are the allegations that Google gave two fired senior executives “exit packages” upon their dismissal. Another executive was allowed to continue working for Google up until this past Tuesday when they resigned. The New York Times report has hit the company hard and former senior executive Andy Rubin has denied the allegations made about him in that report. The report drew a swift response from Sundar Pichai, Google’s chief executive officer. That same day, Pichai and Eileen Naughton, the company’s vice president of people operations, sent an email to employees saying that the company was “dead serious” about making sure the company provides “a safe and inclusive workplace. Pichai and Naughton said that the company had fired 48 people without pay for sexual over the past two years. There is a Twitter account set up that is following the Google Walkout movement which you can monitor throughout the day to catch updates. Below are just a few of the Tweets they’ve made today which shows how large the protest actually is. Most American offices aren’t open just yet but we expect them to become involved at their 11:10 AM local time.